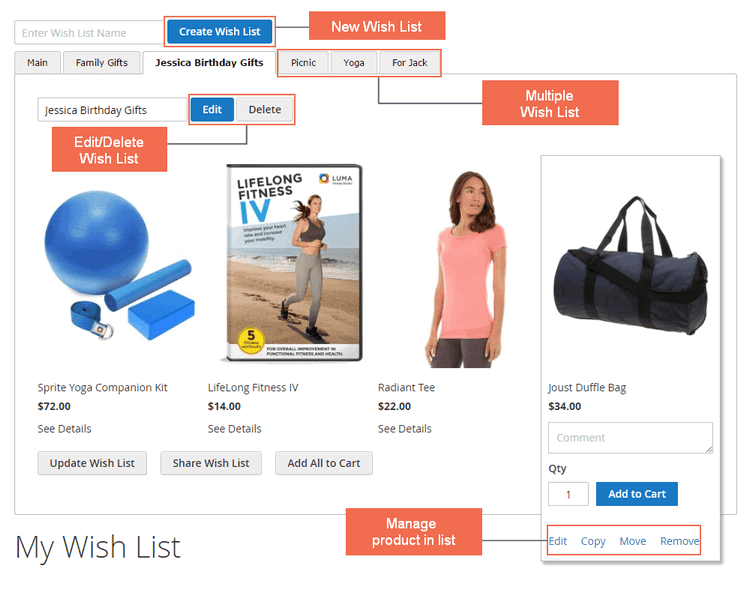 If Shoppers Want Multiple Wishlists, Make it Possible & Easy! Congrats! When one is interested enough to save products to their favorite list, it is strongly possible to turn into real sales later. However, one and only default wishlist breaks it all. Multiple wishlists are also essential for B2B customers since they have a lot lot to purchase. Wishlist is not an ideal place to save all their desired products, but more importantly save which they plan for future purchases. Please keep in mind that wholesalers need quick and neat experience. They have no time, scrolling up and down the endless wishlists. If you support numerous wishlists, the results will be different for sure. See? One small change makes a big improvement in customers’ behavior! Let’s closer look at main features supported by our Magento 2 Multiple Wishlists extension. The only default “My Wishlist” title is not a bit attractive to drive shopping interest. With Magento 2 Multiple Wishlists extension, customers feel free to create and name unlimited favorite lists based on their hobbies or demands. That way, they can track desired products more easily and end up to purchasing decision quickly. Who will miss the wishlist named “Fantastic Party Dress”? “Add to wishlist” popup makes it fast and convenient to save products to any wishlist right from the product page, category, search result, homepage, cms, shopping cart, related, and cross-sell block. Still, customers can use the default wishlist functionalities such as Update Wishlist, Share Wishlist, Add All to Cart. Even more, this Multiple Wishlist for Magento 2 extension offers additional management actions. First, the search wishlist box makes it quick to find the favorite list among many. Then, shoppers can create or delete new wishlist; copy, move or remove items between the lists. Magento 2 Multiple Wishlist is almost plug-n-play, meaning the admin does not have to configure much. The settings up take seconds only. Why Choose This Magento 2 Multiple Wishlists Extension? Buy with another extension for 10% off, say Magento 2 Import Export Wishlist Item. BSS support team installed the extension for me and fixed all problems associated with the custom theme I am using. I highly appreciate this one. You are great, Keep up your work! We tried some modules until we found this one, it is the best and most stable of them all. The settings can be easily made, the installation was very easy and without any problems. We needed an adjustment, and the support was quick and helpful! I had been waiting for its release for quite a long time. Finally, you launched it. I fall in love with it when I see your notification of releasing. Until now, 5 months have gone and it has been running so well on my website. I had a small problem but your support team helped me to solve it quickly. Thanks for the help. I am waiting for more extensions to be launched in the near future. It functions well and the code is good. Also, they included some features I requested, it is free to customize more. Developers are good, too. Good and easy to operate extension. Firsty, I hired a developer to create this function for my store but code didn't work well as my expectation. Therefore, I had to look for an alternative solution and then, I found out your extension on Google search. I took a lot of time to read, test it before making purchase decision because I didn't want to have problems again. Fortunately, this module works so well on my website. I have never faced any conflicts or bugs. I highly recommend installing! Fantastic support and clear manual! the extension works perfectly without any problems. This extension makes me so surprised. This is the first extension I bought from BSSCommerce but you guys surprise me so much with such a very good extension. I get all functions as I expected. My customers often complained about default wishlists because they always want to add products to many wishlists to later consider. However, I am using Community edition, therefore, it is difficult to create more wishlists as in enterprise. But your extension drives me a clearer solution and I am very happy about it. Keeping working to develop more useful extensions for our websites. All features of Magento 2 Multiple Wishlists extension work as described, and what I like most about your plugin is its multiple wishlists to add various favorite item types as wanted. Your module works very well. Having tried the demo of various Magento 2 Multiple Wishlists extension, I decided to have your module installed on my store and it has worked without bugs since then. I'll come back for other extensions. I've just installed your Magento 2 Multiple-Wishlist extension for 3 months, and my customers share that well-displayed and easy-to-manage wishlists make them to come back more frequently to checkout favorite items. Great! I like how the buyer can add products to wish list by popup.